To reach mass adoption, we need to create the world’s most usable cryptocurrency suited for payments, whether you are a consumer or a business. 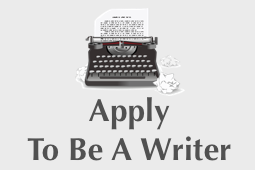 Think descriptions for every transaction, nicknames for addresses, monthly statements, connectivity with social media platforms and full accounting software integration. BitCash makes a difference by combining the power of blockchain with features of traditional banking, always focusing on user experience. The goal of this article is to present the emission schedule of BitCash (BITC). Besides showing just plain numbers, I will also add some qualitative context and explanations. Information presented in this article is entirely from public sources such as Bitcash webpage, Discord channel and Whitepaper. Some statements in this article reflect my own views and opinions, which may (not) be in line with those of the BitCash team. Lastly, before I move on, the source sheet with all calculations covered in this article can be found here. You can download it, go through all formulas and play with inputs or assumptions, if you wish to do so. 1. Aethia, Tamagotchi’s coming to Ethereum! 2. Everything we know about Ethergotchi so far! BitCash is a Proof-of-Work cryptocurrency currently using the Cuckoo Cycle system and forking over to x16R algorithm, scheduled for 23 February 2019. BitCash’s first (genesis) block was publicly mined on 27 August 2018. Total supply is set to 100 million BITC. However, due to the BitCash Stable feature (“burn and mint”), which is upcoming, this figure will fluctuate. The actual effect of this feature on circulating supply can be deflationary or inflationary at any given time. To understand this effect on circulating supply in more detail, please refer to this link for a good explanation with examples. For this article, I assumed that the BitCash Stable feature effect on circulating supply is zero (non-existent) as it is not possible to forecast it. In other words, deflation caused by burning (BITC > BITC Dollar) and inflation caused by minting (BITC Dollar > BITC) would even out on average and have no particular effect on circulating supply, most of the time. 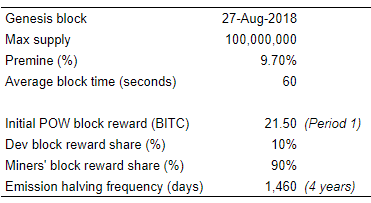 The initial block reward in Period 1, which started in August 2018, amounts to 21.5 BITC. BitCash block rewards are set to halve approximately every four years (2.1 million blocks). At 60 seconds block time, the daily emission (inflation) is close to 31 thousand BITC during Period 1. After 4 years, around August 2022, Period 2 will start and the block reward will be halved, from 21.5 BITC to 10.75 BITC per block. Period 3 (after August 2026) block reward will amount to 5.38 BITC per block and so forth. For a more detailed overview of the emission schedule, see the underlying sheet. 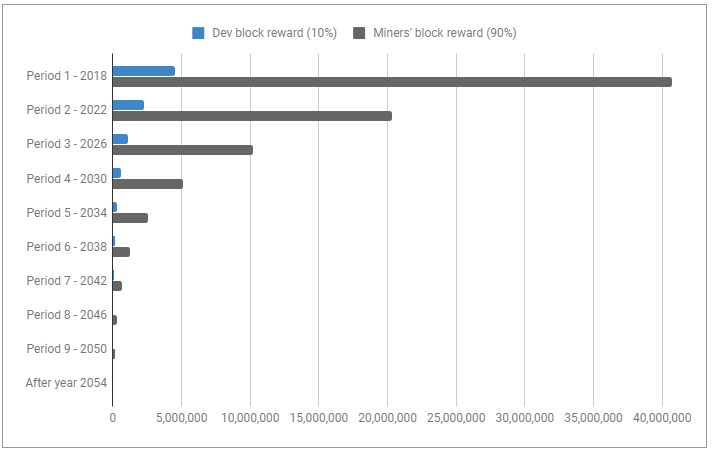 It should be mentioned that 90% of the block reward goes to miners (POW reward), while 10% is allocated for BitCash development. In particular, with the current block reward of 21.5 BITC, 19.35 BITC (90%) goes to miners and 2.15 BITC (10%) to the BitCash development fund. This 10% block reward for development is aimed at covering running costs and expenditures, to the extent possible, such as marketing, bounties, translations, community engagements and similar. If at any given time there is not enough BITC in the development fund to cover expenses, the premined funds will be utilised. BITC price. A higher BITC price would imply that less premine needs to be spent. Scope and size of expenses (listings, marketing and adoption campaigns, designers, copywriters, etc. etc.). For example, if BitCash gets an opportunity for a good exchange listing at reasonable prices or the team wants to hire a developer or marketing person, then the premine will be utilized. This enables the project to have self-sustainable finances from early on, especially while the market cap is still low. There is no release schedule for the premine. Having said that, the team has been transparent about tapping into premined coins to fund the development. Given that there is no release schedule for the premine, I want to show a realistic case here. Therefore, I will assume that every year 5% of the premine will be spent and effectively put into circulation. Precisely, 5% of 9.7m translates into 485,000 BITC per year for the next 20 years. In other words, this will be the inflation resulting from spending the premine. Now, let’s put the premine and the block reward in context with circulating supply. fluctuations in supply resulting from the BitCash Stable feature (“burn and mint”). While writing this paragraph, BITC price is around 1,500 satoshi and circulating supply is close to 6 million. This implies a current market cap of 90 BTC. At a price of $3500 per BTC, 1 BITC is worth about $0.035 or 3.5 cents. Bitcash Supply Overview and Market Cap Scenarios was originally published in Cryptocurrency Hub on Medium, where people are continuing the conversation by highlighting and responding to this story.